Annette Marsh is the director of Taps N Tunes. She grew up dancing and has learned technique from the best in the business. She has been with the organization for 31 years and choreographs dances, sets programs, arranges music, coordinates costumes…she is our volunteer leader. A the present time, she is getting all of the needed parts together for our annual Salute to Veterans program on Nov. 11 at the Hurst Conference center. The photo was taken in Montana from where Annette hails. Thanks to Annette and husband Barry, the Dames dance on. In our second Sisterhood of the Fishnet post, we feature Patti Bertwell, a long-time Dancing Dame and choreographer for our group. To her credit she has composed upbeat dances ranging from "Rock Around the Clock" to "We Go Together." Patti is married and has two adult children and two grandchildren. She is a Zumba instructor and a great tapper. Her entry comes from Covered Wagon Guest House in Mason, TX "It was such a charming place and our hostess, Bridget, was so nice and fun to meet! She is an artist and has an art studio on the grounds. Her creative touch is seen everywhere you turn! She even has a fire pit in the back and bathtubs you can sit in to stargaze! As you can see I couldn't resist using one for our project Sisterhood of the Traveling Fishnet." Helen Doucet, our featured Dame for this week, traveled to the beach in Naples, Forida, for her fishnet photo but probably didn’t catch anything but a few strange looks. Helen was born in Fort Worth and is proud to be still tapping at 76. The mother of three children, grandmother to nine and great grandmother to five, “Tuffy” (Helen} has been dancing since, at an early age, her mother enrolled her in classes to keep her out of trouble. She still enjoys dancing with the Dames as it keeps her mind exercised while she continues to learn the art of dancing. Ward took her traveling fishnet photo in Las Vegas while traveling with her family. You may wonder why she was there, since she doesn’t like to risk her hard-earned funds. Her 12 year-old granddaughter was competing in (of all things) a ballroom dance competition, and Kay and family went to watch. Kay’s family has been involved in dancing for a couple of generations. Her mother taught ballroom dance in Oklahoma and managed to teach Kay enough about tap dancing to get her interested in taking it up again as a Dancing Dame. Kay also loves to travel and, when she is home, teaches yoga. As you can see from her photo, she stays in great shape. As a member of the Sisterhood of the Traveling Fishnet, Kay enjoys supporting Taps ‘N Tunes efforts in providing entertainment to seniors and veterans. Roberta Womack, a member of our Sisterhood of the Traveling Fishnet, not only supports the Dames, she runs her own non-profit dog rescue. A great tapper and friend of Taps ‘N Tunes, Roberta demonstrates her love of small dogs by putting her heart and soul into Lucy’s Lost Loved Ones, another participant in North Texas Giving Day. Be sure to keep her efforts in mind on Sept. 22, North Texas Giving Day. Sister Roberta lives in Fort Worth and works for Bell Helicopter. She has been a Dancing Dame since the early 2000s. Cecelia Rollins Van Donselaar took her traveling fishnets on an Alaskan Cruise and shared the beautiful views with the rest of us. Cecelia spends time off traveling when she is not busy as a realtor in the Fort Worth market. A member of Taps ‘n Tunes for the past 12 years, Cecelia took tap classes briefly as a child but had to give it up. She loved dance, however, so she and her sister would watch American Bandstand and try to copy the dances at home. Later, she took ballroom dance and fell in love with it. Later, as a member of a hula group, she performed with Taps ‘n Tunes in one of the shows. She said she thought the group was fun and hoped she could tap well enough to become a Dancing Dame.She loves the camaraderie, the exercise, the musicality and, as a member of the Sisterhood of the Traveling Fishnets, gets satisfaction from performing for veterans and senior groups. Please support of our Taps ‘n Tunes efforts on North Texas Giving Day, Thursday, Sept. 22, 2016. 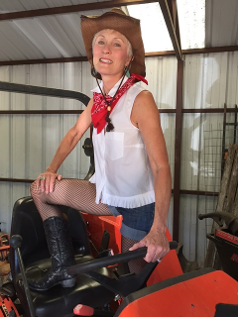 Diane Snow traveled to her 170-year-old family farm in Ontario Canada with her fishnets in July 2016. She has been a member of the Sisterhood of the Traveling Fishnets (a dancer with Taps N Tunes) since 2004. Diane grew up on Long Island NY and started tap dancing in the first grade. She is a graduate of Duke University (class of ’67) and moved to Texas in 1997. She is very proud that she has been a nurse for 49 years. After teaching nursing at UTA for 36 years, she retired in January 2016. Diane has been a psychiatric nurse practitioner for 20 years, earned her doctorate along the way and still works in her private practice in Denton, TX. She sings in her church choir and serves on the board of a local food pantry. She loves dancing with her ” sisters” and performing for seniors . Look for additional “sisters” in upcoming articles in our Dancing Dame Blog representing Taps ‘n Tunes, a participant in the Sept. 22 North Texas Giving Day. Billye Runnels-Jones, a 13-year veteran with Taps ‘n Tunes, has spent her summer traveling to and from physical therapy after receiving a much needed knee replacement. No vacation for the girl this year. Billye was introduced to dancing at an early age when her mother would turn on the record player after lunch and dance to the latest tunes. She would often let Billye put her feet on hers, and away they would go dancing around the room. When she was in the first grade, she started taking tap and ballet lessons and did that for several years. She was in the show group called “The Snyderettes,” and they would do local shows as well as shows in various Texas Panhandle towns. She especially remembers dancing at Boys’ Ranch in Tascosa and then eating dinner with the residents. Through the years, Billye has continued to enjoy many forms of dance including line dancing, ballroom dancing and square dancing. Her time spent with Taps ‘n Tunes has been a very important part of her life, and she cherishes the many fond memories and friendships made with members of the group. Dee Grant started tap, ballet, and acrobatic lessons at age five as a result of a choice her Mom gave her between dance lessons or Brownie Scouts. This was not a hard decision for an overactive five year old, Dee said.She continued until around age 12 when she dropped everything except ballet in order to add piano lessons. During high school, Dee began dancing with the civic ballet in her home town, Montgomery, Al, and returned to them shortly after finishing college and starting her teaching career. A full time job teaching high school English was too time consuming to do much dancing, so little by little, Dee said she lost technique and active roles in dance. At age 28 her Mom dangled another opportunity before her. If she would stop dancing, she would pay for Dee to return to college and get her Master’s Degree. Seemed like a sensible choice, so she accepted, met her husband, and moved away for an Air Force career which included moves from state to state for the next 20 years. No chance to dance, until she moved to Texas and found the Dames in 2009. She said her dance life is complete . . . she’s come full circle! The only difference is the audience. she said she loves her seniors. It is so much more fulfilling to bring joy to them and watch their faces light up as taps and tunes bring back old memories of happy days. Dees asks that you think about us and our audiences as you decide which non-profit to support on North Texas Giving Day, Thursday, Sept. 22. Traveling Sisterhood member Terry Alvarado said she didn’t go far from home to get her fishnet photo. 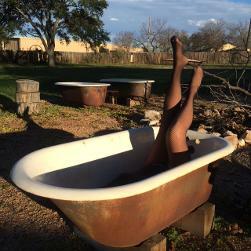 This one was taken in her backyard gazebo in Colleyville. Terry has been with Taps ‘N Tunes since 2007, although she didn’t take her first tap lesson until the age of 45. She said she longed to learn how to tap like the actors in classic musicals, and it was at the urging of her husband that she got out there and found an adult tap class. From her fist shuffle ball change, she said she was hooked. As a Dancing Dame, Terry said she loves the sisterhood and the camaraderie that the group has and added that there is a whole other level of crazy backstage that others would not imagine from this group of classy, mature and dignified women. “I also love the discipline that is needed to put a routine together and the thrill of ‘nailing it’,” she said. The latest entry from the Sisterhood of the Traveling Fishnets comes from a cruise ship in the Mediterranean Sea. Marty Koons, a long-time member of Taps ‘N Tunes, spent part of her leisure time this fall enjoying the scenery in Santorini, Greece. Marty began dancing as a child and took it up again as an adult. She said she has enjoyed being a Dancing Dame for the past 17 years. A retired educator (23 years teaching 1st grade, 13 years as a counselor), Marty has made close friendships as a team member and enjoys entertaining seniors and veterans. She said she hopes the Dames’ performances bring a smile to those who watch them dance. You’re invited to see Marty and the Dancing Dame at the 6th annual Salute to Veterans this Friday, Nov. 11, at the Hurst Conference Center. There will be two USO-style performances as well as displays from the various branches of service and veterans groups. A trip to Niagara Falls by Taps ‘N Tunes member Fran Burns continues the traveling fishnet saga. A native of upstate New York, she thought a side trip to the falls and a ride on the Maid of the Mist while home visiting family would be a great experience, and it was. A member of the Dancing Dames since 2001, Fran learned to dance at age three. Her mother was a dance teacher who had her own studio in Syracuse. Fran and her sister really had no choice but to spend every Saturday, sitting in on almost every class. Fran has two grown daughters and seven grandkids. She said she loves to dance and is so grateful to be part of the Taps ‘N Tunes family. “Please remember our non-profit during North Texas Giving Day. We entertain seniors and honor our veterans,” she said.